Gini Dietrich, Joseph Thornley & Martin Waxman. This week, we take a deep dive into Roger McNamee‘s Zucked. McNamee, an early investor in Facebook and an erstwhile advisor to Mark Zuckerberg and Sheryl Sandberg has provided us with an insightful consideration of how Facebook and social media have changed over time. It is an account that throws light on questions of responsibility and accountability. And while it pulls no punches, it also presents a vision of what might be done to create a healthier relationship between the giant entities that dominate search, social and tech. This should be a a must-read for anyone who deals with social media and search, with marketing and online advertising, with community building. Also, on this week’s show, we pay tribute to Shel Holtz and Neville Hobson’s FIR Podcast, which just hit the 1,000 episode mark. Sometimes weekly, sometimes biweekly and now monthly, Shel and Neville are the seminal PR podcasters. And they’re still going strong and providing insight that we can’t do without. Keep it up guys. Finally, a shoutout to Martin on the completion of an important milestone. Huzzah Martin! Roger McNamee is Zucked – Inside PR 538 by Joseph Thornley, Gini Dietrich, Martin Waxman is licensed under a Creative Commons Attribution-NonCommercial-ShareAlike 4.0 International License. Joe had a moment of surprise when he realized that, not only does he no longer listens to radio, he doesn’t even own a radio! Over the past few years, he had transferred his listening time from linear radio to on-demand podcasts. And he hadn’t even noticed the shift in his media consumption – until his wife threw out the last radio in their house. Since 2010, around 840,000 15 to 24-year-olds have switched off for good, according to research from Enders Analysis. And among the 6.5 million or so who do still tune in, the amount of time they spend listening has plummeted 29% between 2010 and 2018. Both Martin and Gini also have noticed a shift in their media consumption. Not just one that adds to their daily information diet. But a shift that has replaced one medium with another. So, if podcasting is constituting a greater portion of many people’s media consumption, you just know that advertisers are eyeing it and entrepreneurs are looking to provide them with a new medium to reach consumers. We’ve seen Spotify’s big move, acquiring Gimlet and Anchor. This is unlikely to be the last move of this sort. As others follow, what does that mean for the open podcasting system that has let enthusiast and professional podcasters coexist? Will services like Spotify start to push the enthusiasts off to the side, out of sight, as they promote their own professionally produced podcasts so that they can maximize revenue? Sound familiar? Substitute the words blog and Facebook for podcasts and Spotify. So, is this the end? Not necessarily. It may be possible for two systems of podcasting to existing together, thanks to things like Patreon, which didn’t exist during the rise of Facebook and the decline of blogs, along with membership-oriented initiatives life that being advanced by outlets like Slate. If you’re a listener to Inside PR, it’s probable that you too have made room for podcasting by reducing your consumption of other media. Have you done this consciously or has it crept up on you. Do you see a future for enthusiast podcasts like Inside PR — or will we soon go the way of MySpace? As radio fades, can podcasting survive the attention of advertisers? – IPR 537 by Joseph Thornley, Gini Dietrich, Martin Waxman is licensed under a Creative Commons Attribution-NonCommercial-ShareAlike 4.0 International License. In late January, Facebook launched a PR initiative that, on its face, appeared intended to reframe in 2019 the issues that got away from them in 2018, AKA Facebook’s privacy offences that dominated the year since the Cambridge Analytica scandal became public. 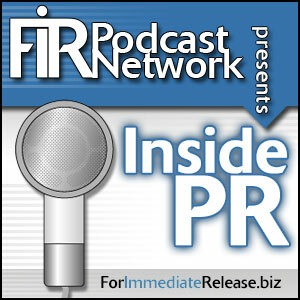 This week on Inside PR, Gini Dietrich, Martin Waxman and Joseph Thornley talk about this first phase of what by late February was unmistakably a concerted effort by Facebook to reframe the issues swirling around it. Martin doesn’t buy Facebook’s argument that we are getting Facebook’s service for free? Not for a second. We’re paying — and the currency is our data. Gini argues that we are the product when it comes to social media. However, she accepts Facebook’s argument that they are not selling our data. Instead, she focuses on the need for each of us to make our own calculation about whether what we receive is a fair exchange for our attention and what Facebook learns about us. And Joe? Well he’s not buying Facebook’s arguments that they don’t sell our data. They do sell the intelligence and insight that comes from possessing our data. And, as far as he’s concerned that makes them “Data Launderers,” the digital equivalent of money launderers. Martin picks up on this and says that we can see Facebook as not necessarily selling the data, but being the agent by which our data is used and obtains the value of using it. And they can do this because they are so big. Perhaps too big. And, says Martin, all you have to do is look at what Facebook is doing with WhatsApp, Facebook and Instagram — rolling up the data each has about us. Different data from what we view as different platforms gives them an even more granular portrait of us that they can draw on to the benefit of advertisers. What of the trust we established with these platforms when they gave us the reassurance of remaining discrete and protecting us from being rolled into an even bigger data bank? Gini brings it back to a pragmatic reality. Facebook has become so effective, so pervasive, so dominant, can an advertiser ignore them? And that leads us to accept their assertions of good intent. Data Laundering the Facebook Way – Inside PR 535 by Joseph Thornley, Gini Dietrich, Martin Waxman is licensed under a Creative Commons Attribution-NonCommercial-ShareAlike 4.0 International License. This week on Inside PR, we talk about the creep factor in social media and the need for us to be aware of the use of our data and to demand control back from the social platforms. Know your ISP knows if you know what it knows about you. – Inside PR 534 by Joseph Thornley, Gini Dietrich, Martin Waxman is licensed under a Creative Commons Attribution-NonCommercial-ShareAlike 4.0 International License. Podnews.net and the Podnews podcast — a template for Alexa Flash Briefings? The Best You Can Be – Inside PR 533 by Joseph Thornley, Gini Dietrich, Martin Waxman is licensed under a Creative Commons Attribution-NonCommercial-ShareAlike 4.0 International License. It’s our first show of 2019 and we decided to make it a more personal show – by talking about the things that are important to us personally and professionally – and what we plan to do about them in the coming year. So, if you want to get some insight into what makes Martin, Gini and Joe tick, you’ll probably find out this week. And along the way, we hope that you may get some ideas for things you may want to do this year yourself. Of course, we’d like to learn from you. So, please share your own resolutions with us. Look at the “It’s your turn” heading below for ways to connect with us. We’ve got resolutions – Inside PR 532 by Joseph Thornley, Gini Dietrich, Martin Waxman is licensed under a Creative Commons Attribution-NonCommercial-ShareAlike 4.0 International License. The past month has brought market and economic turmoil the likes of which we have not seen since 2008. And only one thing is certain. There will be many businesses that do not make it through the downturn. So, what’s the smart agency head doing? Definitely not going all in with a bet on a single business line. Smart leaders are diversifying their revenue stream during this time of uncertainty. And as they do this, they have the best chance of identifying the most promising areas for growth and also being able to exit the business areas without a future. That’s exactly what Gini Dietrich did following the crash of 2008. And since then she has built a very different business – a business that depends on a network of professionals with the range of skills necessary to drive multiple revenue streams. Diversification has been a successful strategy for Gini. And this week Gini Dietrich, Martin Waxman and Joseph Thornley pick up on a recent episode of Gini and Ghip Griffin‘s Agency Leadership Podcast to talk about Gini’s strategy and what others can learn from her experience. Also on this episode, Joe asks Gini and Martin for advice on how they would respond to a pitch that struck Joe as ethically challenged and also how they react to being pitched on pitched on LinkedIn within minutes of accepting an invitation to connect with someone. We’ll be back on January 1 with a New Year’s Resolutions episode. Can your communications business survive an economic downturn? – Inside PR 531 by Joseph Thornley, Gini Dietrich, Martin Waxman is licensed under a Creative Commons Attribution-NonCommercial-ShareAlike 4.0 International License. Don’t just look at the product. Look at the business model. Another blockbuster story from the New York Times (they seem to be making this routine.) This time, the Times stripped away any illusion that we may have had that those give us your location opt-ins are being used only for the purposes we think they are. Scary stuff. Breaking up is hard to do – Inside PR 530 by Joseph Thornley, Gini Dietrich, Martin Waxman is licensed under a Creative Commons Attribution-NonCommercial-ShareAlike 4.0 International License. This week, we cover a new Stories feature that LinkedIn is testing, the launch of another daily news podcast, this time from the Washington Post, and Facebook meets it match in the United Kingdom Parliament. LinkedIn Stories — Putting wings on an elephant? LinkedIn is beta testing a Stories feature called Student Voices. On one level, it sounds like a good idea. However, if aimed at younger users who have seen Snapchat Stories as ephemeral content that enabled them to be spontaneous and genuine without fear of their mistakes showing up in a data cache. When they use LinkedIn Student voices, will they bring this expectation only to discover that the information lingers on their profile and is being viewed by prospective recruiters? Maybe there is an argument for keeping different social networks separate according to use and audience. The Washington Post has launched Post Reports, an afternoon news podcast. It is the latest in a series of high quality news podcasts, including The Daily, Up First, and Front Burner, that collectively signal a significant shift in the news diet of an increasing number of people. They also represent a challenge for PR Pros. The one thing these new podcasts all seem to have in common is that they are highly curated. There are limited slots for stories in the short format adopted by all of the news podcasts – and they are cherry picking for their line up from the stories covered on their companion traditional news outlet. So, getting a story placed and covered on the news podcasts is not a linear extension of the traditional pitch. PR pros will have to watch closely to understand the unique perspective and focus of each of the new podcasts in order to find a way to ease a story’s coverage. But a straight up pitch? Probably not. Facebook may have more members than any country has population. And Mark Zuckerberg may feel he’s too important to accept an invitation from legislators representing eight countries to testify before them. But Mark Zuckerberg definitely isn’t bigger than Damian Collins, MP. Last week, Collins made good on his promise to release the documents from Facebook vs Six4Three court case. And the picture they painted of Facebook’s competitive behaviour and Mark Zuckerberg’s role in decisions that would exploit Facebook user data to advantage Facebook and disadvantage its competitors was …. ugly. Damian Collins 1; Mark Zuckerberg 0 – Inside PR 529 by Joseph Thornley, Gini Dietrich, Martin Waxman is licensed under a Creative Commons Attribution-NonCommercial-ShareAlike 4.0 International License.